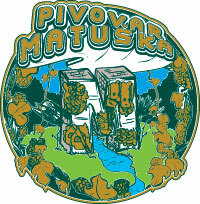 Matuška Brewery. The brewery was established on 13 April 2009, on Easter Monday, when the special dark beer was first brewed. Realization of the brewery took two years. The size of the brewery places it into the microbrewery category. The brewery was founded by brewer Martin Matuška, who has been working in the brewing industry since 1981. The brewery is located in the village of Broumy, located in the Křivoklátsko protected landscape area. The microbrewery came into existence only with the moral support and financial assistance of the entire family. It also helped to know that the younger son Adam wishes to continue in the brewing craft. We produce Matuška beer through craftsmanship, without filtration or pasteurization. This lets the beer retain the properties of a fresh beer drafted directly from the beer cellar. During brewing, we use no sugar, syrups, or hop extract. We produce top and bottom fermented beers. In addition to the Czech pilsner-type, we also brew several types from the world collection. You can taste our beer in beer gardens and pubs in Prague and throughout the entire Central Bohemian Region, as well as in Brno and Plzeň.